"Zombies prove their enduring nature this month. They are the eternal living dead, I'll grant you, but their transition from schlock B-movie to slick Playstation adventure has been so terrifyingly smooth that our flesh-eating friends may well be around for eternity. Resident Evil is a hell of a game and we have the definitive review, a demo on the CD, and a £5-off voucher for the game if we convince you of its worth. Sport also figures highly in PSM8, as we hold more titles than Tyson in our reviews section, including International Track and Field which brought the building to a standstill. But if you started reading this from the top, it may come as a shock to find it's been written by a new Editor. Steve Jarratt, PSM's own resident evil, has moved on, so as sales nudge 50,000 I've swanned in to bask in his glory. Apologies for the literary subterfuge but I want to emphasise that major change is not on the agenda. Alterations will be minor and for the better, starting with a flamboyant looping signature. Like so:"
"Quite possibly the most addictive game in the history of all things. It's a bubble-popping carnival, the like of which will not be seen until the next Milky Way, or something." "An interesting platformer with plenty of neat touches. And lots of cheese. Smashing graphics, but generally plays the role of the traditional jump and shoot game." "Fade to Black is a fabulous sequel and a top game in its own right. A few niggles, but mostly this is a stormingly good adventure." "In-depth, exciting and varied gameplay make Gunship 2000 a sure-fire winner and one that'll keep you quiet for days." "All the multi-player fun of the original enhanced greatly by fabulous visuals. Crap on your own, but with friends, it's top laughs all round." "Never a license to die for, but an intelligent learning curve, accessible controls and realistic gameplay make this surprisingly habit-forming." "It all adds up. Beautiful visuals, fluid gameplay and a chilling tale wedged in between. A Hammer House of Horror on a computer." "Virtual Golf holds plenty of variety and longevity within its multi-coloured confines - just wear your sunglasses while playing." 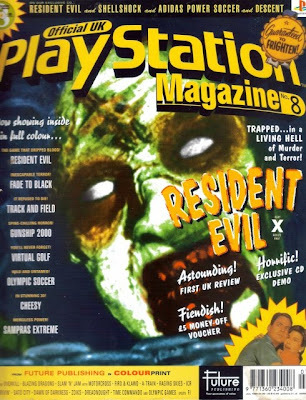 - Sony did not like the warped style of the logo on the cover of this issue. It never happened again. - Phil Harrison: "Namco's titles are literally the reason why we built the Playstation in the first place". - First mention of what would become the Net Yaroze in this issue... "The Let's Create development kit is released in Japan later this month, with the aim to develop creativity among a wider audience. The kit, retailing at around $1200, will include a development Playstation that can be connected to a PC via an interface cable, together with several development libraries and programming tools". - Some of the character names mentioned in the Resident Evil review include "Nancy" for Rebecca and "Westger" for Wesker. Unfinished review code, perhaps? - The pictures in the Olympic Soccer review are slightly curious - the pitches, rather than green, were purple. This was a printing error, as explained in OPM #9, complete with a re-review. Will you ever add something more? Its very interesting to read that, but theres too few articles.